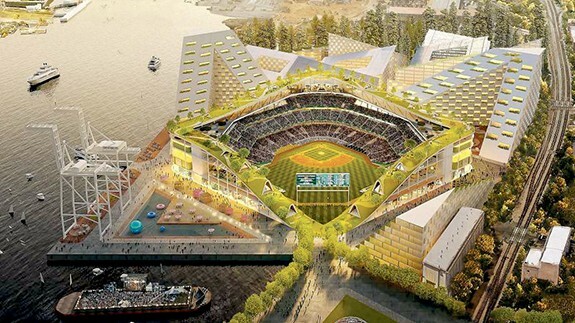 The A's announced their Howard Terminal ballpark plans on Nov. 28. This sports year was likely the last in which Oakland will host three pro franchises. While the A's are still "Rooted in Oakland," the Warriors are on track to open the 2019-20 season in San Francisco, and nobody — least of all Mark Davis — knows what the Raiders are doing next autumn. Amid that uncertainty, perhaps it's not surprising that the past 12 months in Oakland have offered an endless series of contradictions. This year was filled with great triumphs and astonishing losses, hopeful change and depressing failures, Cinderella stories and dysfunctional feuds, as well as exciting announcements tempered by shocking trades. In other words, it was another memorable year in Oakland sports. Let's review the highlights and lowlights of 2018. Gruden also said the timing for taking the job was perfect, even as the Las Vegas-bound Raiders would be forced to deal with major distractions as a lame-duck team in The Town. He also said coming back to Oakland was a big reason for taking the job, omitting the fact that 80 percent of his contract would be spent in the desert. In an Oakland sports year defined by sharp contrasts, Gruden's contradictory comments set the perfectly imperfect tone. Oakland's Warriors in mid-March clinched their sixth consecutive playoff berth. The Dubs finished with a 58-24 record, placing second in the Western Conference. For a fan base that suffered through decades of Warriors' futility, moments like these never feel small. The A's spent the year celebrating their 50th anniversary in Oakland, and those festivities included a game with free admission on April 17 — exactly 50 years after the franchise's first home contest at the Oakland Coliseum. The promotion worked well, as more than 46,000 A's fans went home happy after a 10-2 rout of the Chicago White Sox. The A's started the season with MLB's lowest payroll and equally small expectations. But Sean Manaea sent an early message to the league by throwing a no-hitter on April 21, blanking a hot-hitting Red Sox team that would go on to win the World Series. Manaea's gem was the first of many fun, compelling A's moments at the Oakland Coliseum. The Warriors became an official dynasty by beating the Cleveland Cavaliers in a four-game sweep in the NBA Finals, winning their third title in four years. Then the real partying started, as the Dubs held a long, meandering parade through the streets of downtown Oakland on a picture-perfect June morning. All-pro edge rusher Khalil Mack held out during training camp in a contract dispute, but most observers believed he'd report for duty for the season opener. Mack never got the chance. The Raiders instead dealt him to Chicago for draft picks on Sept. 1. The surprising trade was a stomach punch for most Raiders players, and they've since played like it, in yet another lackluster season. Oh, my God, they actually did it! In late September, the A's shocked the baseball world (again) and clinched a Wild Card berth. A team filled mostly with no-name players (Nick Martini? Josh Phegley? Liam Hendriks?) somehow won 97 games and joined Major League Baseball's elite to play in October. The playoff run was short-lived, though. It ended after a single Wild Card game in The Bronx, where New York routed the A's 7-2. As losses piled up this fall, the Raiders pulled the plug on the season and traded yet another Pro Bowl player. This time it was receiver Amari Cooper, who was due soon for a new contract. The Raiders traded Cooper to the Cowboys on Oct. 22 for a first-round pick. Since the Mack and Cooper deals, both the Bears and Cowboys have become playoff contenders while the Raiders spiraled downward, limping to season's end as one of the NFL's worst teams. As Warriors owners Joe Lacob and Peter Guber have prepared to move their team to San Francisco, they've been trying to avoid paying $40 million to Oakland and Alameda County for Oracle Arena renovation costs. The issue went to an arbitrator who ruled in late October that the Dubs must pay the money, even though they're soon leaving Oakland. It was a rare comeuppance for ridiculously wealthy Lacob and Guber. Perhaps it won't be their last. Kevin Durant and Draymond Green had an ugly verbal fight at the end of a Nov. 12 game against the Los Angeles Clippers. When Durant urged Green to "just pass the damn ball," the combustible Green fired back in a profane barrage of insults that included swipes at Durant's refusal to commit to returning to the Warriors beyond this season. Both players insist they've moved on, but the true test will come during the playoff run next spring, which might be Durant's last with the Dubs. Nearly a year after the A's' plan for a ballpark near Laney College fell apart, team President Dave Kaval announced on Nov. 28 another Oakland proposal: Build a new ballpark on the waterfront at Howard Terminal while also buying and redeveloping 111 acres of the Coliseum complex. Will this plan end the franchise's quarter-century-long search for a new home? Stay tuned. Cal football featured a strong defense and enjoyed a good season, going 7-5 for young head coach Justin Wilcox. The Golden Bears were rewarded on Dec. 2 with a bid to the Cheez-It Bowl in Arizona, where they'll face TCU on Dec. 26. A rare win in Week 14 still left the Raiders with an awful 3-10 record on Dec. 9. It wasn't enough to stop Mark Davis from firing Reggie McKenzie — the team's general manager since 2012 — on the following day. Many believe Gruden wanted McKenzie gone, but the franchise's swirling dysfunction makes it difficult to know who's exactly in charge over in Raiderland these days. The Laney College Eagles on Dec. 8 won the state football title by defeating the Ventura College Pirates. The Eagles, led by head coach John Beam, jumped out to an early 23-0 lead, then held on to win 40-35. It was Laney's first California Community College Athletic Association football championship. After months of speculation, the city of Oakland announced on Dec. 11 that it was filing a federal antitrust lawsuit against the NFL, the Raiders, and the league's other 31 owners, saying the Raiders' move to Las Vegas violates federal antitrust law and seeking damages that could total hundreds of millions of dollars. Proving once again that football excellence is in Oakland's DNA, McClymonds High School won its third consecutive state championship on Dec. 15. McClymonds, led by head coach Michael Peters, defeated Los Angeles' Garfield High School by a score of 32-6. The victory made state prep athletic history, as McClymonds became the first public school to win three consecutive California Interscholastic Federation football titles.